In the past decade, increasing research attention investigated the novel therapeutic potential of steroidal cardiac glycosides in cancer treatment. Huachansu and its main active constituent Bufalin have been studied in vitro, in vivo and clinical studies. This review aims to summarize the multi-target and multi-pathway pharmacological effects of Bufalin and Huachansu in the last decade, with the aim of providing a more comprehensive view and highlighting the recently discovered molecular mechanisms. Huachansu and its major derivative, Bufalin, had been found to possess anti-cancer effects in a variety of cancer cell lines both in vitro and in vivo. The underlying anti-cancer molecular mechanisms mainly involved anti-proliferation, apoptosis induction, anti-metastasis, anti-angiogenesis, epithelial–mesenchymal transition inhibition, anti-inflammation, Na+/K+-ATPase activity targeting, the steroid receptor coactivator family inhibitions, etc. Moreover, the potential side-effects and toxicities of the toad extract, Huachansu, and Bufalin, including hematological, gastrointestinal, mucocutaneous and cardiovascular adverse reactions, were reported in animal studies and clinic trails. Further research is needed to elucidate the potential drug–drug interactions and multi-target interaction of Bufalin and Huachansu. Large-scale clinical trials are warranted to translate the knowledge of the anticancer actions of Bufalin and Huachansu into clinical applications as effective and safe treatment options for cancer patients in the future. Traditional Chinese Medicine (TCM) is a medical practice with more than 2500 years of history in China. It has recently been recognized as a new type of chemotherapy adjuvant that can improve the efficacy of chemotherapy and ameliorate the side effects of cancer chemotherapies. Ever since the launch of chemotherapy for tumor treatment, natural products have become an important source of the development of novel cancer therapies. Although there is no pathological concept of cancer under TCM theory, it is easy to find the descriptions of cancer-like symptoms in the ancient medical documents described as lumps, bumps, and toxins, termed “Chuang, Yong, Zhong and Du (疮痈肿毒)” in Chinese . Therefore, identifying drugs used to treat lumps and bumps, as well as other cancer-related symptoms, such as relief from fever, diarrhea, vomiting, and pain, may link the traditional use of the agent to the modern pathological concept of cancer and may strengthen the pharmacological relevance of TCM to contemporary anti-cancer treatments. Chansu (CS, Senso in Japanese) is the dried secretion from the skin glands of Bufo bufo gargarizans Cantor or Bufo melanostictus Schneider . According to the principles of TCM theory, CS is commonly used to counteract toxicity, alleviate pain, and induce resuscitation [3, 4]. It can be considered as an anti-infectious agent for pyogenic infection induced unconsciousness and may be related to its anti-inflammatory and anti-microbial effects [3, 5]. In TCM practice, CS is prescribed to patients with “heat and toxins” syndrome, which refers to the modern concepts including acute gastroenteritis, severe vomiting, diarrhea, abdominal pain, high fever, carbuncles, lumps, and bumps . Huachansu (HCS) is an injectable form of the sterilized hot-water extract of CS . It is manufactured by Anhui Jinchan Biochemistry Company Ltd., in Huaibei, China [Chinese Food and Drug Administration, FDA (ISO9002)] and is widely used for inflammatory diseases as well as for the treatment for various types of cancer, including liver, lung, pancreatic, and colorectal cancers in China [8, 9, 10, 11, 12]. The molecular basis for the anti-inflammatory effect of HCS is proposed to be the bioactive steroidal cardiac glycosides . Indeed, glycosides isolated from HCS have been shown to possess blood pressure stimulation, respiratory excitation, anti-inflammatory, anesthetic, and anti-neoplastic activities . 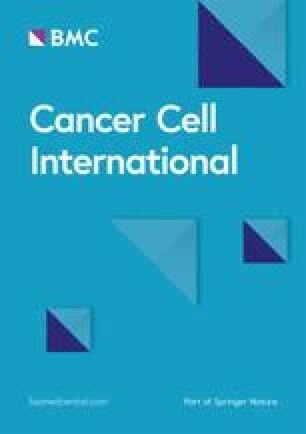 HCS and its derived single compounds may achieve their anti-inflammatory effects by modulating nuclear factor-κB (NF-κB) signaling and down-regulating inflammatory-related genes such as cyclooxygenases, lipoxygenases, inducible nitric oxide synthase, and thereby decrease nitric oxide and prostaglandin E2 (PGE2) production [9, 11, 12, 13]. In cancerous cells, glycosides derived from HCS also exhibit cytostatic and cytotoxic activities, induce cellular apoptosis, inhibits angiogenesis, reverses chemotherapeutic drug resistance, and modulate immune responses. Previous studies suggest that Na+/K+ pump or sodium- and potassium-activated adenosine 5′-triphosphatase (Na+, K+-ATPase) is a potential drug target that contributes to the selective control role of cardiac glycosides in tumor proliferation, but does not affect normal cell growth [10, 15, 16]. Moreover, accumulating evidence reveals the anti-cancer effect of HCS and its derived single compounds in several tumor types in vitro and in vivo. Furthermore, in the last decade, some studies have proposed new properties and effects of HCS, Chansu and their major active constitutes, bufalin, in the treatment of cancer (Fig. 1). Interestingly, there are an increasing number of studies investigating both in vitro and in vivo experiments in the recent 5 years, indicating an increased awareness of the translational potential of HCS and its derived steroidal cardiac glycosides in animal studies. In this review article, data on the anti-cancer effect of HCS and its major active constitutes bufalin published in the recent 10-years were retrieved from databases including PubMed, MEDLINE, CNKI, and clinicaltrial.gov. This review focuses on the anti-cancer pharmacological effects and mechanisms of action of HCS and bufalin, with emphasis on elaborating the translational potential and future clinical application. This review article also discusses the recent studies on drug delivery and its derivatives. The chemical composition and pharmacological activity of HSC have been investigated since the 1980s [7, 14, 15, 17, 18]. HSC contains two primary bioactive chemical components, indole alkaloids (bufotenine, bufotenidine, cinobufotenine, and serotonin), and steroidal cardiac glycosides [7, 14, 15, 18]. Their extraction rate is mainly determined by the extraction method. High performance liquid chromatography (HPLC) quantitative analysis confirmed that the aqueous extract of HSC yield around 20-fold higher serotonin than bufadienolides (75.7 ± 0.1 mg/g and 3.8 ± 0.0 mg/g, respectively), while methanol or ethanol extraction solution contains 5–26 times higher concentrations of bufadienolides, with only trace amounts of serotonin . So far, there are more than 28 steroidal cardiac glycosides identified from HCS . The investigation into the potential use of cardiac glycosides in cancer therapeutic was initiated more than 40 years ago, yet was abandoned due to the toxicities . However, in 1999, Scandinavian oncologist Haux  reported that digoxin induced tumor cell apoptosis in a variety of human cancer cell lines at non-toxic concentration. Recent studies demonstrated that steroidal cardiac glycosides are the major anti-neoplasm component of HCS. Bufalin (PubChem CID: 9547215, Chemical formula C24H34O4, Fig. 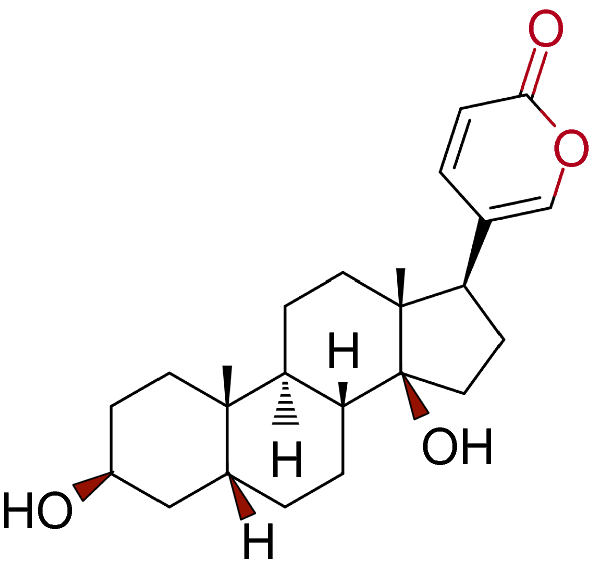 2) is a cardiac glycoside and the major active component is attributed to the anti-tumor activity of HCS . Similar to other bufadienolides (such as resibufogenin, cinobufagin, and bufotalin), Bufalin is a cardioactive C-24 steroid characterized by an α-pyrone ring at C-17 [22, 23]. Bufalin exhibits a variety of biological activities. Its structural similarity with digitoxin accounts for both the therapeutic effect as well as the unwanted side-effects such as cardiotonic, blood pressure stimulatory and respiratory stimulatory effects in cancer treatment [20, 24, 25]. Recent studies emerge on purified compounds and cardiac glycosides. Bufalin may represent a promising form of targeted cancer chemotherapy for long-term applications without severe side effects. It appears that the cytostatic effect of Bufalin and HCS is well demonstrated in a variety of tumors such as breast, colorectal, gastric, lung, liver and bone tumors. The 50% inhibition dose (IC50) among cancer cell lines after 1–3 days of treatment are summarized in Table 1. The in vitro effects of Bufalin and HCS in arresting cell cycle, inducing intrinsic and extrinsic apoptosis are reproducible across studies. Recent studies have confirmed that Bufalin can lead to cell cycle redistribution, at least in part by its role in the inhibition of Na+/K+-ATPase activity, in various types of human cancers [26, 27]. In cancer cells, Bufalin can arrest cell cycle at G0/G1 and G2/M phase, owing to the various dosage of treatment and cell lines [28, 29, 30]. The sensitivity to Bufalin treatment varies among cell lines. Currently, there is a lack of in-depth study to predict the exact effect of Bufalin on cell cycle. Moreover, it is worth noting that one article published in 2013 by Clifford and Kaplan suggested that Bufalin and other cardiotonic steroids, including Ouabain and Digitoxin, can inhibit membrane Na+/K+-ATPase activity in multiple cell lines regardless of metastatic potential [31, 32]. Also, human breast tumor cells are more resistant to growth inhibition and apoptosis induction of cardiotonic steroids than non-tumorigenic breast cells . The 50% inhibitory dose with 24-h of Bufalin treatment in metastatic invasive ductal carcinoma MCF10CA1 cell and the invasive estrogen receptor (ER)-negative MDA-MD-231 breast cancer cell is two- and threefold, respectively, the dosage of human noncancerous mammary epithelial cells 184D and 184A1 . Another study on the effect of HCS on normal human lymphocytes was marginal (with more than 60% viability at 48-h) compared with A-549, Jurkat, MCF-7 cancer cells (with less than 10% viability) at a dose of 0.16 mg/mL of CS extract . However, a majority of studies investigating the cytostatic effect of HCS and Bufalin are carried out solely on tumorigenic cells instead of normal non-cancerous cells. Further investigation is warranted to elucidate the pharmacological action of Bufalin treatment. To evaluate the anticancer potential of Bufalin in vivo, various xenograft mice models are carried out throughout cancer types such as breast, cervical, colorectal, liver, gallbladder, lung, and pancreatic cancer. The results are very compelling that Bufalin can inhibit xenograft tumor growth, increase sensitivity to chemotherapy, and prolong the survival rate of mice. Most of the studies reported a dosage of 0.1–2 mg/kg intraperitoneally (i.p.) administered at a frequency of once per day 5 days per week to every 3 days for a period ranging from 12 days to 6 weeks in mice xenograft model without inducing significant weight loss or adverse effects, as summarized in Table 2. In the recent 10 years, although in vivo studies have been increasingly used to assess the effect of Bufalin. Most of the studies have used the xenografts models and reported the attenuation of tumor growth rate as well as the reduction of tumor weight. Yet, the lack of orthotropic models in the Bufalin research led to a relative shortage in the evaluation of the systemic effect of Bufalin contributing to not only the tumor itself but to the microenvironment or tumor metastasis. Further studies are warranted to elucidate the related effects. Injecte 1 × 106 cells intravenously via the tail vein. Inject 2 × 106 cells into the subcutaneous tissues. Combination treatment inhibits tumor growth and tumor angiogenesis in vivo. 10 days after injection, (1) control group: 100 mL of vehicle i.p. ; MTX group: MTX (250 mg/kg) with calcium leucovorin rescue (24 mg/kg at 16, 20, or 24 h after MTX) i.p. per week; (3) low Bufalin group: 0.75 mg/kg i.p. ; (4) High Bufalin group:1.5 mg/kg i.p. The acute toxicity measured as 50% lethal dose values for Bufalin in mice when administered intraperitoneally was approximately 2.2 mg/kg, as first reported in1960 by Okada et al. by Wang et al. in 2003  and by Liu et al. in 2016 , consistently. Bufalin showed the lowest toxicity when injected intraperitoneally among principle active components, including cinobufagin and resibufogenin, isolated from CS . When administered intravenously (i.v.) to rabbits, Bufalin induced an elevation of blood pressure accompanied by marked respiratory excitation. Yet, although Bufalin is structurally slimier to digitoxin that both of them possess the same aglycone except for the lactone ring in 17-position, digitoxin does not induce respiratory excitation induced by the i.v. administration of Bufalin was not observed with digitoxin intervention at a dosage as high as 0.2 mg/kg via i.v. injection . A study in 1995 examined the toxicity and teratogenicity of CS using a single i.p. injection into maternal mice during the embryonic organogenesis . At doses below 50 mg (dry weight)/kg body weight, no detectable changes were observed in both maternal mice and fetuses; however, at a dose of 50 mg/kg, adverse effects were found with a reduction in maternal mice body weight, liver, and kidney structural abnormalities, and an increased number of resorbed and dead fetuses . It is worth noting that most studies have reported a significant reduction in tumor growth rate and tumor weight after i.p. injection of Bufalin. An article reported a contradictory result in a breast cancer xenograft model with an intra-tumoral injection of Bufalin in 2017 . The results showed that intra-tumoral injection of 10 μL of 1 μM Bufalin, three times a week for 4 weeks, equivalent to 3.87 ng per mice, significantly enhanced tumor growth by promoting inflammatory response compared with intratumoral injection of saline via increasing expression of COX-2/IL-8, promoting p-65 NF-κB translocation and modulating mitogen-activated protein kinase (MAPK) pathways . This contradictory result may be due to the difference in not only the route of administration but also the difference in the equivalent dose among studies. As previously reported, for example, Han, et al. conducted a study in 2007 and reported an anti-tumor effect of Bufalin with i.p. injection of 0.5, 1.0 or 1.5 mg/kg/day for 10 days in mice hepatocellular carcinoma (HCC) xenograft model with a body weight around 18–20 g, which is equivalent to an i.p. injection of 10 to 30 mg/mice of Bufalin throughout the course of treatment . Other studies, as summarized in Table 2, reported anti-tumor effect with i.p. administration of doses ranging from 0.5 to 1.5 mg/kg at a frequency of daily injection for 10 days, every other day injection for 20 days or once every 3 days for 4 weeks. There appears to be more than a 1000-fold difference between the anti-tumor effect reported by i.p. injection and the pro-inflammatory or tumor-promoting effects upon intra-tumoral injection. A variation in doses is also found. According to the material and safety data sheet, the median lethal dose of Bufalin administered to mice by i.v. injection was 0.74 mg/kg . It is plausible that the contradictory results on the tumor suppressing or the tumor-promoting effects of Bufalin may be due to the variation among different cancer cell lines, different route of administration, or different doses used. In future research, more in-depth study using the same treatment protocol is needed to better assess the role of Bufalin in cancer treatment. The cell cycle arresting, intrinsic (also known as mitochondria-mediated) and extrinsic (also known as receptor-mediated) apoptosis-inducing effects of Bufalin at concentrations ranging from 1 nM to 10 μΜ, such as intracellular reactive oxygen species (ROS) production, caspase-dependent apoptosis, modulating MAPK signaling cascade, inhibiting NF-κB signaling, are well not only well established among various cancer cell lines [29, 40, 41, 42, 43, 44, 45, 46, 47, 48, 49, 50, 51, 52, 53]. The steroid receptor coactivator (SRC) family, including SRC-1, SRC-2, and SRC-3, is involved in molecular and physiological processes across diseases by activating nuclear receptors and other transcriptional factors, such as NF-κB. SRCs are frequently overexpressed in malignancies and are associated with cancer cell proliferation, invasion, and metastasis [54, 55, 56]. Previous studies suggested that Bufalin promotes SRC-3 protein degradation in breast, gastric and lung cancer [36, 55, 56, 57, 58]. Moreover, Bufalin suppressed triple negative breast cancer proliferation at a nanomolar concentration (~ 3–5 nM), which the concentration of which digoxin required to inhibit SRC-3/SRC-1 is greater than 200 nM . The effective concentration of Bufalin to inhibit SRCs is within the on cardiac toxicity concentration reported in patients plasma (~ 9 nM) . Furthermore, the water soluble prodrug of Bufalin, 3-phospho-bufalin, inhibits the growth of orthotopic triple negative breast cancer . All in all, Bufalin is a potent and safe steroid receptor coactivators inhibitor. Although the exact mechanism of the anti-cancer effect of Βufalin has hitherto been unknown. It is worth noting that several novel mechanisms contributing to the anti-cancer effects of Bufalin are proposed and increasingly studied in the recent 10 years, including sensitization of TRAIL-mediated apoptosis, autophagic cell death induction, reversing chemotherapy drug resistance, suppressing cellular invasion, migration, and anti-adhesion, inhibiting epithelial–mesenchymal transition, as shown in Table 3. A schematic summary of the molecular mechanism of Bufalin-mediated anti-cancer effect is shown in Fig. 3. In contrast to the apoptosis-inducing activity of Bufalin, well-documented in various cancer cell lines, 100 nM of Bufalin does not induce caspase-dependent apoptosis in human colorectal caco-2 and HT-22 cell lines . Instead, Bufalin induces cell death by triggering autophagy, possibly through a ROS- and JNK-dependent pathways in colorectal cancer cells, followed by increased expression of ATG5 and Beclin-1 without significant induction of apoptosis, PARP cleavage, and caspase-3 cleavage . It may be plausible that Bufalin enhances the radiosensitivity of colorectal cancer through ROS-mediated autophagy, which deserves further investigation . In addition to inducing apoptosis-dependent cell death, laboratory studies have suggested that Bufalin (0.1–1 μM) inhibits Na+/K+-ATPase activity, a crucial ion pump, and transducer ligand receptor. It suppresses cancer cell proliferation and possesses synergistic effect with Sorafenib against liver cancer [60, 61]. Changes in Na+/K+-ATPase activity play an important role in cell survival and function, and high expression of Na+/K+-ATPase subunit α is associated with poor overall survival in liver cancer patients . Moreover, compared with adjacent tissues, the expression of Na+/K+-ATPase subunit α1 was significantly elevated in liver cancer tissues, suggesting that the specific targeting of Na+/K+-ATPase can have therapeutic effects on cancer cells without noticeable effect on normal cells . The role of Na+/K+-ATPase in mediating cytotoxicity of Bufalin should be highlighted, and further studies are warranted. Hyperactive angiogenesis is a hallmark of cancer cells. It not only provides oxygen and extra nutrient, maintains the high proliferation rate of cancer cells, but also promotes local and distant metastasis of malignant cells . Bufalin had been reported to inhibit cancer cell migration and invasion in liver cancer and lung cancer cell lines by down-regulating vascular endothelial growth factor (VEGF), which plays a major role in tumor angiogenesis [46, 63, 64]. Anti-angiogenic drugs, such as Sorafenib, may be complicated by relatively easy-acquired drug resistance, rapid onset of relapse after discontinuation, and the potential for tumor metastasis. A previous study revealed that Bufalin enhances the anti-angiogenic effect of Sorafenib via AKT/VEGF signaling . The co-administration of Bufalin and Sorafenib provides a novel therapeutic option for patients with advanced HCC and is worthy for further in-depth investigations [63, 64]. Matrix metalloproteinases (MMPs) are a class of enzymes that degrade extracellular matrix proteins and are thought to play important roles in cell proliferation, migration, angiogenesis, and etc. In cancer cells, especially those with high metastatic potentials, MMPs, in particular, MMP-2 and MMP-9, are highly expressed . MMP-2 and MMP-9 primarily control cancer cell motility, and down-regulation of these proteins was reported across studies to reduce cancer metastasis [66, 67]. Bufalin was found to down-regulate MMPs in human liver cancer, lung cancer, osteosarcoma, and etc. [68, 69, 70]. In human HCC, Bufalin inhibits metastasis both in vitro and in vivo through pathways including the Akt/GSK3β signaling, E-cadherin/β-catenin nuclear translocation [66, 71, 72, 73]. In lung cancer cells, Bufalin (25–10 nM) was observed to suppress MMP-2 and MMP-9 expression, which were mediated through multiple pathways, including p38 MAPK, c-Jun N-terminal kinase (JNK), extracellular signal-regulated kinase1/2 (Erk1/2), focal adhesion kinase (FAK), Rho-associated protein kinase 1 (ROCK1) and NF-κB [69, 70, 74]. Bufalin is a broad inhibitor of various inflammatory signaling pathways in cancer. It was noticed that in human hepatoma cells, the expression of the inflammatory protein COX-2 is down-regulated and is associated with the inhibition of cell invasion and migration . The epithelial–mesenchymal transition (EMT) is a process in which epithelial cells malignant phenotypes to become mesenchymal stem cells that promote metastasis. Bufalin was found to inhibit EMT in cervical, colorectal, hepatic, lung cancer by downregulating mesenchymal markers and upregulating epithelial markers [66, 67, 71, 75, 76, 77, 78, 79, 80]. Bufalin can attenuate transforming growth factor-β (TGF-β)-induced upregulation of N-cadherin, vimentin, and Snail while downregulating E-cadherin by targeting hypoxia-inducible factor-1α (HIF-1α) . In addition, the regulating of motility and invasiveness of cancer cells may be related to the PI3K/AKT/mTOR pathway [76, 81], Wnt/β-catenin pathway [66, 77], Hedgehog signaling pathway [67, 82], and etc. Bufalin is reported to act as a natural anti-inflammatory small molecule that upregulates osteoprotegerin and down-regulates receptor activator of NF-κB ligand (RANKL), ameliorating cannabinoid 2 receptor (CB2)-mediated cancer-induced pain and bone destruction . Bufalin also down-regulated several metastasis-related genes, such as Rho-associated (Rho A), integrins and FAK [70, 80, 84, 85]. A recent study revealed that bufalin combined with sorafenib synergistically inhibited liver cancer cell migration by targeting mTOR/Akt/VEGF signaling and affecting tumor vascular microenvironment [63, 64]. Few genomics and proteomics approaches are used to study the anti-cancer effects of Bufalin or HCS. Using a comparative proteomics approach, Xie et al. [86, 87] identified that Bufalin modifies 24 differentially expressed protein, particularly, the expression of proteins involve in cell metabolism, apoptosis, and cytoskeleton structure. Among them, the heat shock protein 27 (Hsp27) decreased remarkably, and its down-regulation played a critical role in bufalin-induced apoptosis in osteosarcoma cells [86, 87]. Another study used two quantitative proteomics methods, isobaric tags for relative and absolute quantification (iTRAQ)-based and label-free proteomic analysis, to study the target-related proteins of Bufalin in human A549 lung cancer cells . The number of the differentially expressed protein commonly found in the two methods is 45 proteins, suggesting that the involvement of oxidative stress and the fibronectin-related pathways are important pathways for the anti-cancer effect of Bufalin . Wu et al. reported in 2014 that Bufalin modulates about 165-apoptosis-related genes in human lung cancer CNI-H460 cells using Affymetrix GeneChip. These results provide a deeper understanding of the anti-proliferative and cytotoxic mechanisms of Bufalin at the genetic level in gene assays . Although a small number of proteomics studies and gene chip arrays have studied the target-related proteins or genes involved in the anti-cancer effect of Bufalin, which can serve as a paradigm for further studies of the molecular basis of Bufalin against various types of tumors, there is a lack of transcriptome analysis and other high-throughput screening in examining or predicting cell response to Bufalin treatment at both cytotoxic level and non-cytotoxic level. There is a need for high-throughput analysis to better associate the change of mRNA levels correlated with protein–protein interactions or protein–DNA interactions . Further work is warranted on the molecular mechanism of Bufalin and HCS against various tumors. Bufalin participates in complex cell-signal transduction pathways, which contribute to its suppressive effect of tumor progression in various cancer types. However, its structural similarity to digitoxin, digoxin and other cardiac glycosides accounts for the toxic effects at a high dosage. Previous studies suggest that Na+/K+-ATPase is a potential drug target that contributes to the emerging role of cardiac glycosides in selectively controlling tumor proliferation, but does not affect normal cell growth . In the recent years, emerging newly discovered HCS derivatives have been shown to process anti-tumor effects, such as BF211, have been shown to inhibit colorectal, gastric, and lung cancer [91, 92]. In the process of seeking to improve the anti-cancer properties of Bufalin, several drug carriers have been synthesized with Bufalin, such as carbon-based nanomaterials, including liposomes and polymeric microspheres, folate receptor-targeted supramolecules, or [18F]fluoroethyl conjugates [93, 94, 95, 96, 97, 98, 99, 100, 101]. Structurally modified and synthetic Bufalin-loaded nanoparticles are designed to promote tumor-specific drug release and cytotoxicity, increase cellular uptake, and improve bio-distribution at the tumor site [99, 102, 103]. Some studies have reported that internalization of the Bufalin nanoparticles may at least partially contribute to the increased intracellular uptake of Bufalin in cancer cells [85, 93, 95, 102, 104, 105, 106]. However, there is still a need for better therapeutic materials with good drug solubility, well binding affinity, high tumor-specific targeting, low systemic toxicity and rapid clearance. As a cardioactive steroid, Bufalin has a variety of biological activities, such as cardiotonic, blood pressure stimulation, and etc. At high dosages, cardioactive steroids can cause cardiac arrhythmias and exhibit cardiotoxicity. The concentration of CS (400 ng/mL) extract and Bufalin alone can induce myocardial cell arrest within a few seconds after administration by altering intracellular calcium storage in cardiomyocytes and possibly acts on sites other than the Na+/K+-ATPase . Koh et al. reported that zebrafish larvae responded to 100 µM Bufalin and showed a decrease in heart rates, early depolarization and polymorphic arrhythmia-like changes. Another study found that the addition of Bufalin to guinea pig papillary muscle (0.4 µmol/L) or atrium (225 nmol/L) preparations can lead to arrhythmias . Further study on the effect of ethanol extract of Chinese toad venom (EET) on mice showed that 5 mg/kg of EET caused liver toxicity cardiomyocytes injuries [110, 111, 112]. In a Pilot study of HCS in patients with HCC, non-small cell lung cancer, or pancreatic cancer showed that side effects that may have been related to HCS were hematologic (thrombocytopenia and leukopenia), gastrointestinal (loss of appetite, constipation and diarrhea), mucocutaneous (dental ulcers and rashes), and cardiovascular (premature ventricular contraction and hypertension) in nature. Others include myalgia, dyspnea and dizziness . However, when using HCS, no dose-limiting toxicity (DLT) was observed at doses up to 8-times higher than the usual dose used in China (conventional doses = 20–25 mL; highest dose = 162 mL). To the best of our knowledge, the typical therapeutic doses of HCS have not found significant side-effects in clinical studies. However, it has been reported that HCS can reduce the side-effects of chemotherapy and radiotherapy in gastric cancer, lung cancer, colorectal cancer, and etc. [9, 11, 113, 114, 115, 116]. Due to the potential toxic effects of other cardiac glycosides, careful clinical evaluation should be performed prior to Bufalin administration. Huachansu injection is a sterile hot-aqueous extract of dried toad skin, is approved by the Chinese FDA for use at oncology clinics in China. Since the 1970s, various clinical studies in China have demonstrated the anti-cancer properties of HCS, with a total response rate of 10% and 16% for patients with advanced liver and lung cancer, respectively. In a previous clinical study, the quality and consistency of three separate lots of HCS were evaluated . It was found that and levels of bufalin and resibufogenin in HCS were 18.0–19.5 ng/mL, and 17.7–19.0 ng/mL, respectively . The variation between three lots of HCS was remarkably close, with less than 10% variation. In the detection of bufadienolides concentration after i.v. infusion of HCS in human plasma specimens, the levels of Bufalin, cinobufagin, cinobufotalin, and resibufogenin in the used in a phase I clinical trial was 14.3 ± 0.03, 3.35 ± 0.1, 21.5 ± 0.22, and 24.5 ± 2.18 ng/mL, respectively . As for Bufalin, which studies have shown is the major bufadienolide with the most pronounced anti-cancer activity, was further evaluated its concentration in plasma by liquid chromatography with mass spectrometry (LC/MS/MS) and found a maximal plasma levels at the end of the 2-h infusion which is proportional to the amount of drug administered (0.81–3.38 ng/mL) . In a clinical phase I study of HCS in patients with HCC, non-small cell lung cancer, or pancreatic cancer published in 2009 and found that HCS is partially effective on cancer patients . Only mild adverse events were observed, with doses up to five times the conventional clinical dose, which is approximately 15 mL of drug per meter squared of body mass (mL/m2) . Furthermore, a phase II randomized controlled trial (RCT) of patients with advanced pancreatic adenocarcinoma (PaCa) treated with HCS in 2012 reported no clinical benefit with the addition of HCS to gemcitabine, which is similar to over 30 previously published well-designed RCTs in patients with advanced PaCa evaluating gemcitabine in combination with other cytotoxic or biologic agents . However, the lack of efficacy observed in these trials does not preclude the possible efficacy of HCS in other solid malignancies. There is an increase in related publications later (Fig. 1a), indicating an increasing research interest on the potential use of HCS and its derived steroidal cardiac glycosides in cancer therapy. However, the report on the outcome of any RCT published after the phase II clinical trial is not yet available. At present, TCM is practiced all over the world. Natural products have long been an important source of cancer treatment. CS has been used for thousands of years in the practice of TCM in aqueous extract form for the treatment of cancer. HCS has been used either alone or in combination with chemotherapeutic agents. Since the phase I study of HCS in patients with liver, lung, or pancreatic cancer in 2009, there is an increase in related publications, indicating a great interest is brought on the potential use of HCS and Bufalin in human. HCS and Bufalin exhibit a wide range of biological effects in cancer, including inhibition of cell proliferation, induction of cell apoptosis, disruption of the cell cycle, inhibition of metastasis, reversing multi-drug resistance to chemotherapeutic agents, and regulation of the immune response. HCS and Bufalin also have multiple other effects such as respiratory excitation, anti-inflammation and analgesics [83, 118]. Cancer is characterized by inflammation, and the chronic inflammatory microenvironment is often associated with malignant progression. The anti-inflammatory effects of Bufalin may at least in part contribute to its anti-cancer effect targeting the tumor microenvironment. The involvement of various inflammatory mediators such as COX-2 and PGE2 may be produced not only by cancer cells, but also by the surrounding immune cells, fibroblasts, and endothelial cells. The production of inflammatory mediators may create a positive feedback loop to further promote cancer proliferation, angiogenesis, invasion, and metastasis. Although most studies reported the anti-inflammatory effect of Bufalin, in breast cancer, Bufalin was reported to promote inflammatory response, accompanied by increased COX-2/IL-8 expression and enhanced tumor growth in vivo . The role of Bufalin on NF-κB signaling and pro-inflammatory mediators, such as COX-2, inducible nitric oxide synthase (iNOS), tumor necrosis factor alpha (TNF-α), interleukin 1 beta (IL-1β), and interleukin 6 (IL-6) are studied across diseases, including rheumatoid arthritis [119, 120], asthma , bacterial infection , and chronic inflammatory disease . It is worth highlighting that Bufalin may also possess chemo-preventive potential in skin cancer when administered topically in a rodent model . Future research may extend to other types of human diseases. Research on the interaction between stromal cells and tumor cells may not only broaden the potential use of Bufalin and HCS, but also helps to understand the tumor immune microenvironment, thereby providing long-lasting repression against cancer growth for future cancer treatment. Previous studies found that the expression of Na+/K+-ATPase subunit α1 is prognostic in liver cancer patients and is significantly elevated in cancer tissue compared with adjacent tissues [27, 60]. Recent studies of cardiac glycosides suggest Bufalin may potentially represent a promising form of targeted cancer chemotherapy on Na+/K+-ATPase subunit α1 that can be safely used for long periods without severe side effects [27, 60]. Furthermore, the results indicated that the down-regulation of Na+/K+-ATPase α1 can inhibit cell proliferation, migration, and invasion in vitro, and inhibit tumorigenesis in vivo [26, 27, 124]. These increase the likelihood of selecting patients with high Na+/K+-ATPase subunit α1, may improve the therapeutic efficacy of Bufalin and HCS. It is worth noting that since June 2015, another Na+/K+-ATPase inhibitor, RX108, is structurally similar to Bufalin and is undergoing phase I clinical trials to evaluate the safety, tolerability, pharmacokinetics, and pharmacodynamic properties in patients with locally advanced or metastatic solid tumors in Australia. However, as of July 2018, there were no recent reports for phase-I development. This study, if successfully completed, may provide valuable information about the safety of targeting Na+/K+-ATPase. In the process of identifying active anti-cancer ingredients in Traditional Chinese Medicine, some encouraging results have been achieved and we deepened our understanding of the underlying mechanism of malignant behavior. With the growing awareness of the tumor microenvironment and the wholistic immunomodulation, it is possible that agents with systemic effects may be a double-edged sword. In the identification of novel therapeutic agents, agents that target multiple signaling pathways may have a stronger anti-cancer effect, but inevitably carry more adverse effects, such as gastrointestinal burden and hematological toxicities. Studies combining conventional cancer treatments (such as chemotherapy and radiotherapy) with TCM or derived components should be interpreted with caution, as drug interactions caused by combination therapies may have a negative impact on conventional cancer treatments, reducing their effectiveness. It is also essential to further study the underlying pathophysiological mechanisms of anti-cancer effects and adverse reactions. Inevitably, there is a great need to discover long-term effects, drug use sequences, drug–drug interactions, and individual choices further for different drugs, aimed at improving patients’ quality of life and prolonging survival. Vigorous studies and discoveries have revealed the anti-tumor properties of Bufalin and HCS as potentially multi-targeted agents for cancer treatment. The results indicated that Bufalin inhibits tumor progression by inhibiting cancer cell proliferation via both apoptosis dependent or independent pathways, as well as inhibiting metastasis via repressing cell motility and angiogenesis. Many animal studies and clinical studies conducted over the past decade have revealed their clinical potentials, however, in the current study, long-term toxicological studies on different individuals, pharmacodynamics studies on various dosages and administration routes have been relatively lacking. Further research is needed to elucidate potential drug-drug interactions and multi-target interactions of Bufalin and HCS. Large-scale clinical trials are warranted to translate the knowledge for anti-cancer effects of Bufalin and HCS into clinical applications as effective and safe treatment options for future cancer patients. Overall, this review highlights the advances in the study of Bufalin and HCS as emerging anticancer agents over the past decade and may shed light on the future direction of Bufalin and HCS as novel anticancer agents for clinical applications. Huachansu and Bufalin possess anti-cancer effects both in vitro and in vivo. The multi-target and multi-pathway pharmacological actions are promising. Potential drug–drug interactions and multi-target interaction lacks studies. Further large-scale clinical trials are warranted. Conceived and designed the study: C-SC, JW, JC, LC, ZC, ZM. Collected the literature, wrote the manuscript: C-SC, JW, JC, K-TK, TJ, HG, LC. Collected and drew figures: C-SC, JW, JC. Revised the manuscript: C-SC, JW, JC, TJ, HG, ZC, ZM. All authors read and approved the final manuscript. The authors deeply appreciate Dr. Xiaoyan Zhu, Dr. Yawen Geng, and Dr. Ye Li for their advices and constructive comments for this review paper in preparation. The work was supported by National Natural Science Foundation of China (NSFC) [Grant No. 81573753].